A Bookshelf Full Of Bedtimes. Smoke was rising from the base of the blender with the optimism of the beginnings of a campfire. I was pretty sure that with a handful of dry bark and little blow in the right direction we could have added toasted marshmallows to the breakfast menu. After disconnecting everything and attempting to eradicate the aroma of burning plastic, I sat down at the table to hear one of my children say to the other. “Hopefully not one of us!” said the first little traveller as she smiled in my direction. If G and I were to have drafted a resume of relevant skills for child raising in our early years, we possibly would have grasped at very different straws. G’s perhaps would have mentioned his ability to put things together: IKEA furniture, strollers, children’s beds, and tricycles. Along with his ability to cook. My skills would have been more in the party planning variety. You can always rely on me for booze and music. An email from Henry Hotdog’s teacher suggested he’d misplaced a book from his classroom. This is a tune we’ve sung before. I imagine there’s a picture of our family in the manual for new library staff. *watch out for these guys*. Last night as we made our way through our collection of books I grumped and moaned that we were back here again. “When did you last see it? Why is this library book here?” I let out a dramatic sigh. I was on the war path. Name and shame. 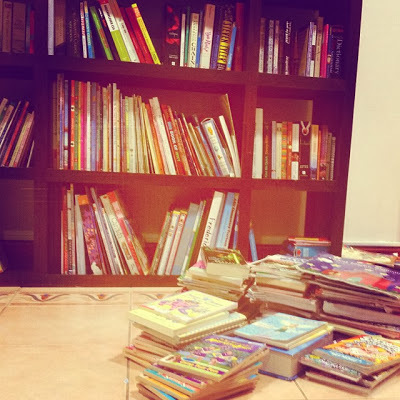 Each book was dramatically removed from the bookshelf. The old faithfuls were pulled out with each book – look after your things, be responsible, take more care. My children chose to ignore me and concentrate on fueling my anger by absentmindedly thumbing their way through my organized piles. They’d got me at my most vulnerable point. I loved that book. I could picture each little face as I read it. The excitement of a new baby, the conversations about what the baby would be doing. Did it have a train track to play with in my tummy? When you have bacon and eggs Mummy does the baby get bacon and eggs? I glanced over at them flicking through the well worn pages of our old favourites. Books that I knew I could never throw out: Jillian Jiggs, Olivia, The Gruffalo, Goodnight Moon. The bookshelf was full of bedtimes. Freshly bathed little bodies between the sheets. Butterfly kisses, one more page, just one more? “Remember when you’d sing that song Mum? After you’d kiss us goodnight, you’d sing that song in the doorway?” I thought about my ridiculous matching dance movements timed in with an enthusiastic Skin-a-marinky-dinky-dink Skin-amarinky-doo. I couldn’t find the book, but I’d put on good show at bedtime. I could always be trusted for booze and music.